We've spent the last week with family Up North in Michigan. 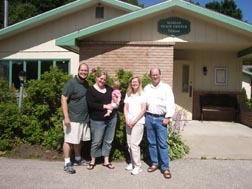 Josh and Lori Mercer of the Marian Center in Petoskey Michigan allowed us to stay in a lodge in the woods. Visit their website at www.mariancenter.org. I gave a talk at the Center on Peter: the Rock, the Keys and the Chair. If you are ever in upper Michigan you should visit them if you can — nice folks, nice place. I was deeply immersed with every free minute in writing the Study Guide for the Apostolic Fathers DVD. This is the most difficult to write since I cannot just use references from the Bible and the Catechism. I have to include a lot of quotations from the actual writings of the Fathers. But it has been extremely rewarding. While in the woods I finished chapters 1, 2, 3 and most of 4. Very pleased. This DVD will out in September. We also had some time to watch birds which is one of our family hobbies — a hobby of mine since I was about 10 years old. We saw Scarlet Tanagers, Bald Eagles, Peewees, Indigo Buntings, Wild Turkeys and many more. Great fun. My wife's family lives nearby in Indian River and all our kids came up with us and stayed with Grandma and Grandpa Sklenar. We went rafting, eating, played games, read books and much more. I love being a dad and being a family. 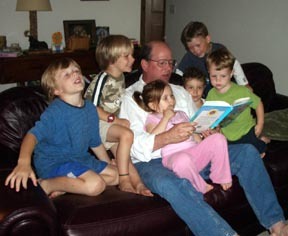 In the picture you can see me reading stories to some of my grand kids and a few nephews.